Watching videos on YouTube or browsing through photos on Facebook is inherently a social action that you may do with friends while in front of a computer or TV. 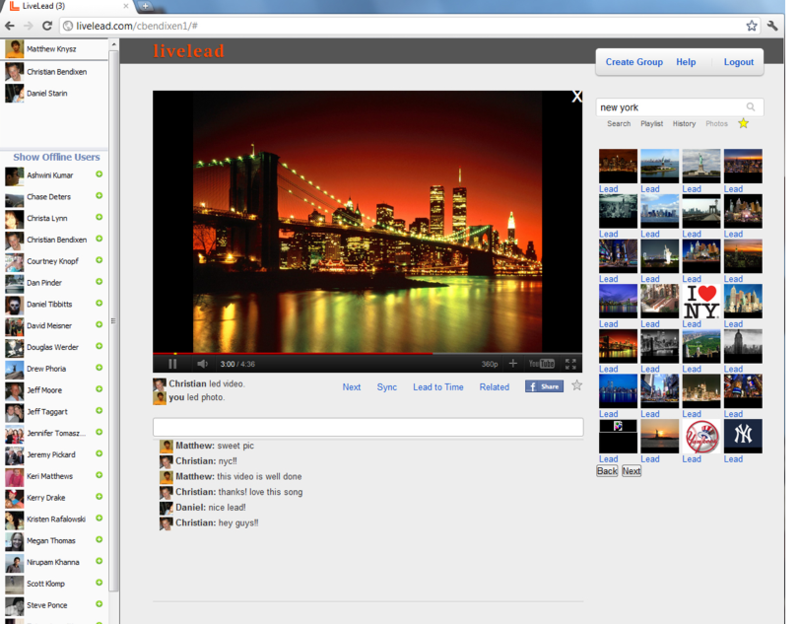 Startup LiveLead, which is in private beta, allows you to remotely watch and chat about YouTube videos or photos remotely with your friends in real-time. Anyone in the group can search for new content, click ‘lead’ and it will automatically load on everyone’s computer. We have 500 invites for readers to try out the service here. Here’s how LiveLead works. You can create a room to share and watch YouTube videos in. You actually log-in with Facebook, and you’ll see a list of your friends that you can invite into a room. You simply click the ‘+’ symbol next to their name to send them a link that invites them to your active LiveLead group. If they are online, it will send them a link via Facebook chat, and if they are offline, you can send the invite link via a customizable Facebook message. You can then search for any YouTube video or your images on Facebook, and share this media with others and chat about what you are sharing via Facebook chat within the group. In terms of individual features, LiveLead allows you to sync videos so that everyone is watching at the same point in a video or slideshow. You can also find a specific instance of the video that you want to share with your friends, and fast forward to that part of the video. Everyone’s computer will instantly start playing the video at the desire point. Leaders in a group can also create a playlist of videos to continue to play, and save videos to your profile for later. Leaders can also preview a YouTube video on the right hand side of the application without disturbing the rest of the group before you share it with the group. LiveLead co-founder Christian Bendixen tells me that the startup wanted to recreate the action of sending links to YouTube videos and sharing new content in a more social and engaging setting. He adds that LiveLead is also working on ways to forms groups with friends and browse the web together as a group, similar to screen sharing but with individual abilities to control what each person is watching. There are other platforms that allow for group-viewing experiences, such as Google Hangouts, but Bendixen says that LiveLead provides a more social experience based on your Facebook friends.